This coat is for an 'A' measurement of 35 inches. Please ensure you measure your dog before ordering. A durable coat that is both waterproof yet breathable. 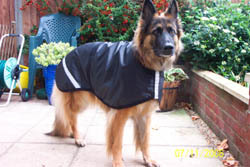 Designed to cope with the heaviest wind driven rain for the life of the garment. It has a tough flexible coating to withstand rigorous use while unaffected by dirt, salt and other contaminants. Reflective strips as shown in the image are available as an optional extra.